B 3 HOT is a compact distributor of creams and hot products: ideal for anyone with restricted space who still wants to enjoy the good things in life. You can use the special dispenser to fill or garnish croissants with various types of cream, or else the device will keep tea and other infusions at the correct temperature. 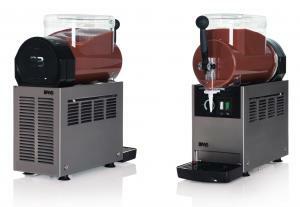 This simple, reliable machine has been designed to dispense small portions and so avoid unnecessary waste. Thanks to its manual thermostat, B 3 HOT is extremely easy to use, and will help you boost your business by offering special products for your clients.